Okay, this one is a little different. If you’re writing along with the posts then you’re already well into the first few pages of your novel, so this post is either going to come too early or too late, lol. Basically, this is something I tend to cover in my typical, face-to-face writing seminars with Ellen Curtis and Kenneth Tam that tends to go over very well, so I’m going to try and duplicate it here. There’s a way that I structure story-arcs for my series’, specifically the Black Womb series, and it’s served me very well. It’s a way of thinking about multiple story-lines and character arcs so that you can keep track of them all. Please forgive my art, I’m not terribly talented as it is, and even worse when using the Draw! app on my iPhone. Hopefully this won’t be too confusing. Alright, so this one is fairly straightforward, yes? I hope so anyway. If not, blame me. This is supposed to be the storyarc for your novel. For those looking for the experience of an actual writing seminar, picture me scrambling madly while scribbling this on a dry erase board. 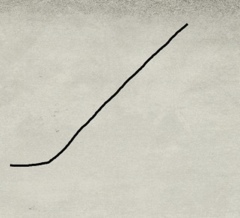 So, this black mark represents the story of your novel. As the line gets higher, so does the excitement of your reader. At least, that’s the hope. 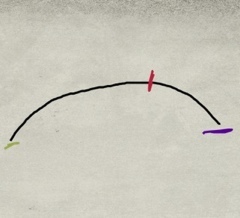 Then green mark represents the beginning of your story, and the purple one the end. See that red one? That’s the climax. In Back to the Future, it’s Marty rides the lightning back to 1985. In Almost Famous, it’s when the kid finally gets his interview with the rock legend. It’s the end of the story, really. Everything before it is buildup and everything after is cleanup. This is the moment your audience should remember. Not marked here (sorry) is the inciting incident. Basically it takes place near the beginning of the story and is the question that is answered by the climax. In Black Womb it’s Jamie Dawkins’ death, and the climax is the revelation of he killer. But it’s not that simple, is it? Nothing really is. Some children’s novels are that simple (and that’s fine), but you’re writing an epic. You’re writing a goddamn masterpiece. In this next image, we again have that pesky black line representing your novel, but this time its got company. These are your sub plots. In this novel, we have three. 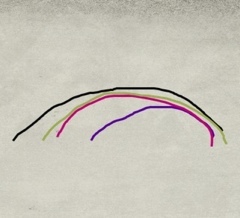 They’re the green, pink, and purple lines. Going back to the Back to the Future example, it’s the romance between Marty and his Mom. Another is the romance between his Mom and George. A third is if Doc Brown will die or not. See? All these plots start at different times in the larger arc. They can also end at different times… Although if you can swing it so that they all end at once and dovetail together, it makes for epic storytelling. It doesn’t always work, but when it does both writer and reader feel great about it. It’s goosebump-inducing satisfaction to produce that kind of fiction. Most novels are structured this way. So, great! You’ve made an epic novel. Interesting characters, and wow that climax! All the plots converged at once!… What now? I mean, some people would just repeat the same formula and make another epic novel… And if you do that, move power to you. You’ll probably make more money than me, you little Stephen King in the making, you. But that’s not what I did. I prefer series’ to individual novels. So that’s what this next diagram is about. 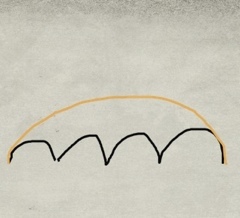 In this one the black arcs are still novels, but there are four novels in the series so far and they’re all connected by the orange arc: that’s the storyarc. I do this with Black Womb. The first three novels form a great little arc. Books four through seven form another arc I call “Peterson Syndrome”. Another good way to look at this diagram is like seasons of a television show. Take Buffy the Vampire Slayer. Each black arc is an episode, and when you put them all together they make a season, one BIG story. Like the Glory / Dawn arc in season four. Or the Dark Tower series, another great example. Remember that within each black arc there are multiple character arcs and smaller subplots. If possible, these novels should have a common theme. Theme isn’t necessary, but it’s nice. If possible the action should be upped with each additional book as well, until the last one is just an epic season finale. Okay, you’ve got your box set of like, four books. You can count yourself amount the Tolkiens and the Kings. Are you done? I’m not. The next stage of the game looks like this. 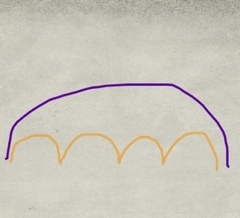 The orange arcs represent the three to four book “seasons” that they did in the last sketch, now with a fancy purple line encompassing the whole thing. This is the series plot. Just like all other plots, it has a beginning, middle and end. It gets more and more exciting until it’s conclusion. This is he model I’m working with, remembering again that within each season are multiple novels and within each novel are multiple plots. This is a massive undertaking, and is the reason guys like Jay Paulin referred to people who start a series as “gutsy” in his review of my first book. It takes a lot of planning and even more work afterward. Here’s one that doesn’t quite fit with the rest. It’s basically the same as the last, but shows different character arcs. Here there are three, but if I had to map them all there would be hundreds. Let’s look at the pink one. Let’s call that Cathy. Maybe her main arc starts at book eight and ends around book nineteen. Or whatever. And each character could have more than one. So there are layers within layers of this. There are other schools of thought of course. I feel like I’ve been preachy during this post, and if that’s he case it wasn’t intentional. 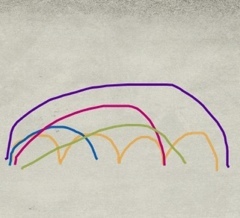 Some plots follow a graph much closer linked to a three act structure. Some are all over the place, but honestly those tend not to do well. Sometimes they become cult classics, but it’s rare. Basically after that first, initial slow beginning it never stops. This is hard to do and requires meticulous planning. I have never seen this in a novel but would love to. It’s something I tried very hard to emulate in Becoming, the seventh Black Womb novel. Don’t think I quite hit the mark, but had fun doing it. Hope this helped anyone who needs help. Extremely good report .I just stumbled upon your weblog as pleasingly as sought to utter that I have genuinely enjoyed browsing your page posts.After all I will be subscribing to your rss feed as highly as I anticipate you write over quickly! As a final point , permit me thank you for your patience with my English as (I’m persuaded you have become aware this by now,), English is not my mother language therefore I am utilizing Google Translate to figure out how to write what I genuinely have in mind to write . Do you possess any idea why I sense Java fault messages while visiting your web site in Explorer ? As a final note , let me thank you for your understanding with my English as (I’m certain you have become aware this at this moment ,), English is not my initial language thus I am utilizing Google Translate to build out how to write down what I sincerely wish to write down . Before I go, permit me thank you for your understanding with my English as (I’m confident you have become aware this at this time ,), English is not my number one tongue thus I am utilizing Google Translate to figure out how to compose what I really mean to tell. Thank you for this post, my writing group is taking on the ambitious project of co-witing an epic fantasy with several story arcs. ‘Cathy’s’ diagram helped clear it up in my head.